Swastikas, Palestinian flags and "Palestine is ours" slogans were spray-painted on the ancient synagogue in Naaran near Jericho overnight. Public Diplomacy Minister Yuli Edelstein condemned the act and remarked it was no wonder the Palestinians desecrate an ancient synagogue "after destroying and desecrating Temple Mount remnants." The Minister added, "The incident reaffirms the belief that Jewish holy sites must be under Israel's sovereignty." The ancient synagogue in Naaran was built in the Sixth Century and attracts both worshippers and pilgrims. The compound contains an ancient mosaic and archeological treasures. On Friday, a group of worshippers was shocked to find that the site had been vandalized. "I was shocked to see the destruction," said Dr. Yoel Elitzur who led the group. "It turns out that general values of respect for antiques mean nothing to these savages. The site must be placed under Jewish control as soon as possible." Members of a group organizing visits to the site expressed outrage over the vandalism and lack of Jewish security at the synagogue. "The historic mosaic is an important testament of our people's history. A people that do not guard their past have no future. If the IDF is incapable, we will protect the synagogue with our bodies." Other elements in the Right said that the incident could cause an escalation. MK Michael Ben Ari (National Union) called on the Shin Bet and Israel Police "to treat the desecration of the synagogue as if it were a mosque otherwise the government will inspire a series of Price Tag acts." 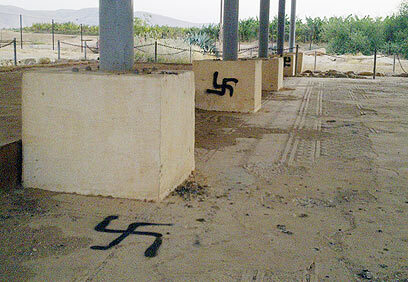 See all talkbacks "Swastikas sprayed on ancient synagogue near Jericho "